” The World First 200GB SD Card in Markets ” now you if you want you can buy it from Amazon or Other website. It is now available for sell in different markets amazon and aliexpress. These days we were having small SD cards in our Mobiles Phones for less storage like 8GB, 16Gb up to 64Gb now you will be able to install SD up to 200GB which is great for saving huge data in your SD with Super Fast speed it can do 1200 Photos Per minute, It is not yet cheap to buy, but maybe in future it will be cheap because of new technology arriving very fast these days. The World’s First 200Gb SD Card. 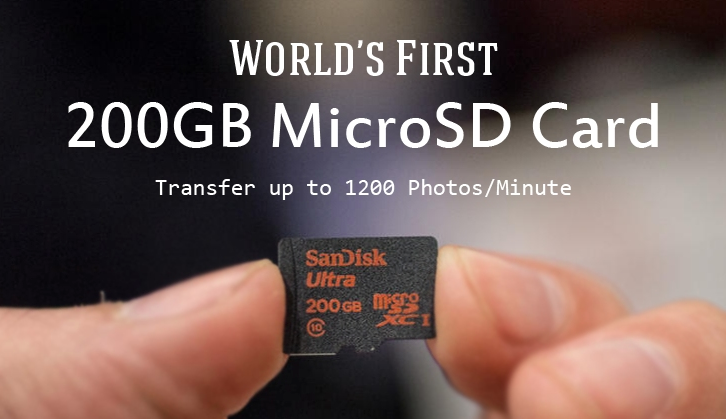 If we go back in March, the Sandisk announce their new 200GB microSD Card. It is the World’s First 200GB SD Card, that was expected to be of $400. However, it is now of $240 in different markets like Amazon highest-capacity microSD card. Talk about it’s Transfer Speed. The New SD Card 200GB has a Great Speed, Ultra microSDXC UHS-I card, it can transfer up to 90MB/per second, and it’s the double speed of the previous 128GB counterpart. The Sandisk company claims to have a speed that allows the 1,200 Photos in a minute. This card is best for Photographers and Filmmakers and for personal use. The World’s First 200GB SD Card comes with a Great Features of Fast Data Transfer, waterproof, shockproof, temperature proof, magnet proof and X-ray proof that is possible with any destruction. Well it’s a great chance to get this SD Card which comes with awesome features in it, it’s a bit expensive too, else buy small storage depends on you.